In too deep. My journey out of debt. My debt has decreased by an overall reduction of $17,337 in 32 months. 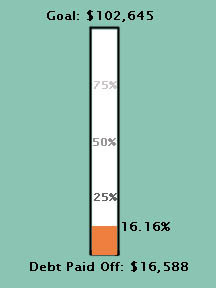 I’m now at 16.89% of my debt payoff goal. Way to chisel down the debt. Don’t grow weary! Keep it up. So many people are struggling with their own debts, and your story is and will be an inspiration! Thank you! It’s definitely a difficult journey. Will be checking out your site for some motivation! Chronicling my efforts to pursue a healthier and happier lifestyle.